Greetings and salutations everyone; yes, once again it is I, Chess the purebred border collie, filling in for the guy I live with, and here to thrill you and chill you with the latest, most exciting, most riveting, most interesting post it’s possible to make. You may remember me from such exciting and riveting posts as “Little Red Elephants” and “Revenge Of The Rodents”, among so many, many others. Here I am in a characteristic nose. I mean pose. I guess things have been going okay with me; the guy I live with doesn’t seem too hugely worried anyway. It warmed up a whole bunch and then cooled off, and then warmed up, and then cooled off again. It snowed a little today. The guy I live with said “One hundred and nineteen flakes”, as if he could count that fast. And then the sun came out. Some cutting down of things went on yesterday, and the day before, too. He says he gets dizzy sometimes, leaning over and cutting back plants, and could use an assistant, but he has to stick with his imaginary one. You know, Tania, the one who never shows up. This is what the “new view” looks like with almost everything cut back. About the same as before, really. 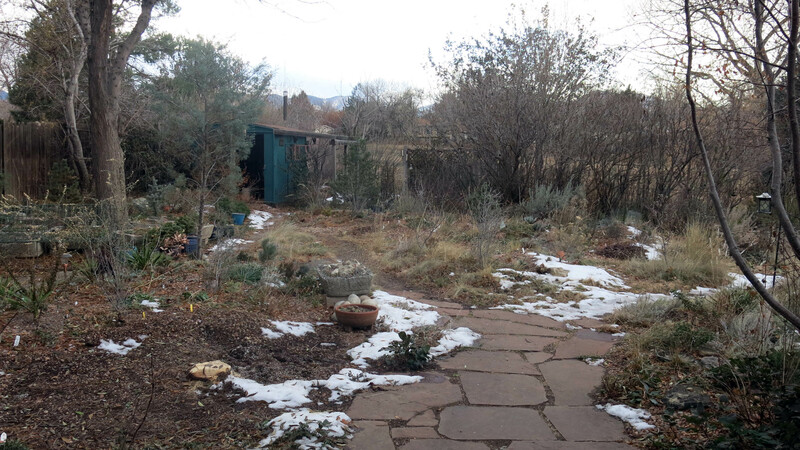 A new rock garden is going where the pinyon stump is. Some time in the future, I understand. And all the plants that were planted to take up space are going to be moved, to make room for “cooler plants”, which I guess makes sense. 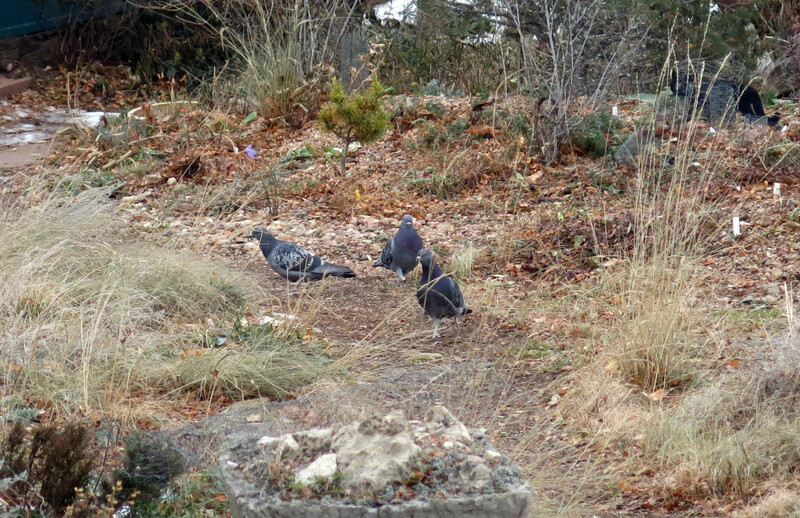 And so, to celebrate the new view, or something, we had some very exotic birds land in the garden, and they started to eat stuff off the ground. I’m not allowed to do that, though I still do, sometimes. 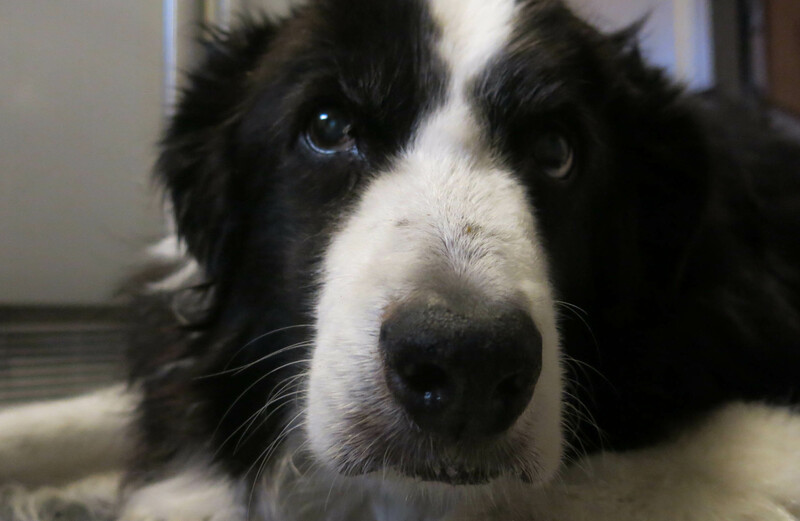 My grandpa Flurry was a big one for eating bird seed, which the guy I live with said was a very low thing for a purebred, herding certified border collie to do, but he did it anyway. 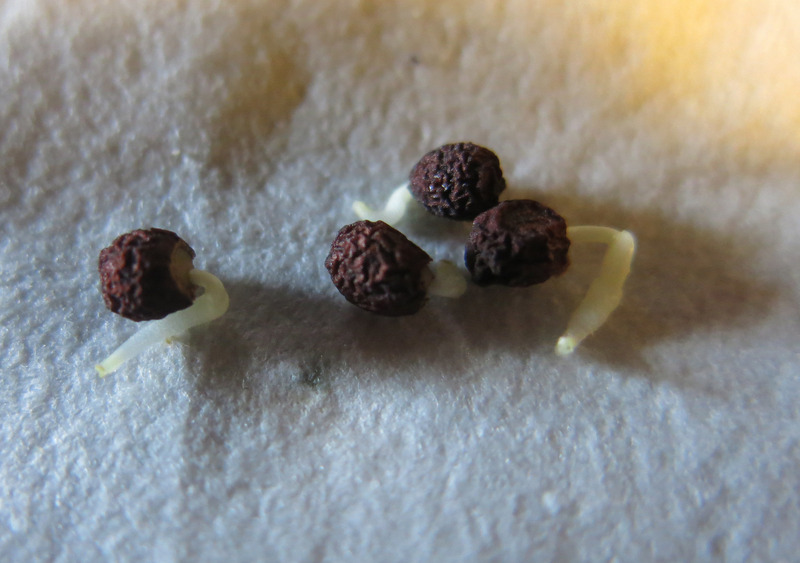 In other news, the guy I live with made his seed-sowing mix yesterday. It’s just peat moss, perlite, and sand, with some Turface (calcined clay) thrown in, too. At first he said he was going to screen the peat moss, which he does for making troughs, but he decided not to. 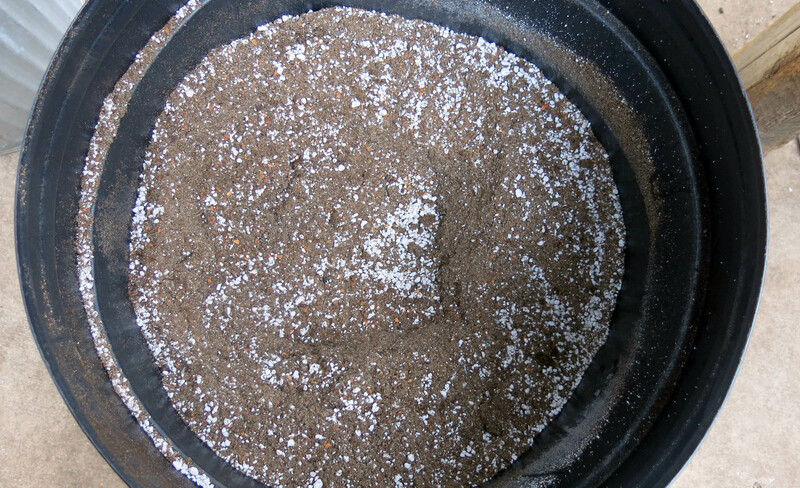 The mix goes into a (clean) trash can and sits out on the patio, making it look like stuff is done around here. This is for seed sown in pots and left outdoors, which isn’t much of anything resembling work, if you ask me. Exactly how much work is it to leave something outdoors? Other things do resemble work, and come with instructions, which the guy I live with paid no attention to (typical) and wondered “why the stupid iris seeds didn’t germinate”, but after he read the instructions, and decided they “weren’t technical enough”, which is why he couldn’t understand them, he did some studying (for once), and figured out what the instructions were trying to tell him. Slicing into the seed embryo with a razor blade and things like that. You might think, “Iris, huh”, but it’s not that way at all. Here’s a publicity photo of Iris lycotis from our garden, just to remind you. It is a big deal. Let’s see now. 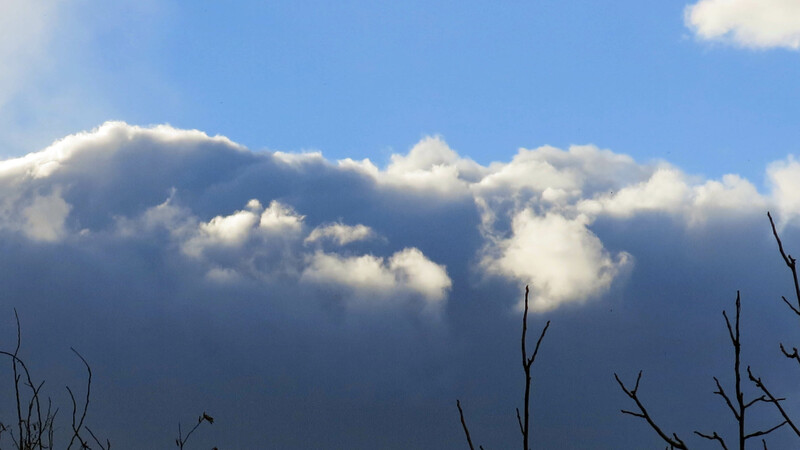 Oh, I have a picture of the way the sky looked today, before it snowed those 119 flakes. And a picture of me doing one of the things I do best. If it looks like that 4×4 on the left is leaning a bit, that’s because it is. The camera lens does distort a little here, but the post is still leaning. It was pushed a little to the north when we had huge piles of snow on top of the patio cover, winter of 2006-07. The guy I live with braced it, some. That was the winter that the patio slab on the right cracked in four places, because there weren’t any expansion joints included. The heated birdbath is very important to the birds. The birdbath hasn’t frozen much in the last couple of nights, though. Now that really is all. You know I’m going to have to hear about iris seeds for a long time to come, but I guess it gives the guy I live with something to do. This entry was posted in Uncategorized and tagged Iris lycotis. Bookmark the permalink. Most garden supports around here lean, Chess, and I can’t say it’s through distortion or even snow weight. Around here, things just lean. Although we do have healthy iris, they’re Pacific Coast and not gorgeous purple iris finally germinated from exotic seed collected in northwestern Iran fifteen years ago. Little wonder the guy you live with is excited. Thank goodness he had filter paper to dampen. Hope those birds find a lot to eat on your grounds – those are Huge Birds. You look supremely right, Chess, lying out on your patio, just the place for you under your beautiful sky. Goodbye for two weeks *waves*. We leave tomorrow for Tasmania to check out heritage roses. I’ll keep an eye out for pure-bred border collies, but thus far I’ve never seen a match for you in personality, even the delightful Momo. You roll well from majestic to mischievous with ability that outclasses all others. I expect to find you, Chess, holding down fort, home and grounds when I return. Thanks; have a good time Down Under. I bet there are purebred border collies, or maybe Australian shepherds, herding sheep there. Or just looking ornamental. The roses will all be growing upside down, according to the guy I live with, so be prepared for that. The really big birds started walking up to the patio, which was a bit scary. For some reason, pigeons have been attracted to the roof of the house three doors down, and no one has ever been able to figure out why. Occasionally they decide to land in our yard, and they look really big, because they kind of are. Until a hawk or owl lands in the yard, and then “big” becomes relative. Hi Chess, we’re back and never going to that place again. Seem to be getting my mum’s health problems sorted and we just caught up with your posts and you look great, lost so much weight, smiling about it and the snow. The garden looked so good with all that snow and you do love to walk in the snow. You’re diet is doing you good and you’ll be around for a long time to come since you are trim and getting around more easily. Nice to see all these garden shots and odd flower, sad to see the snow melt. we’re raring to go so see you next time. Thanks; it’s always good to be back from somewhere you don’t want to be, isn’t it? We both like staying at home because my mommy made the house so cozy. The snow is mostly gone now, but I’m sure it will come back. 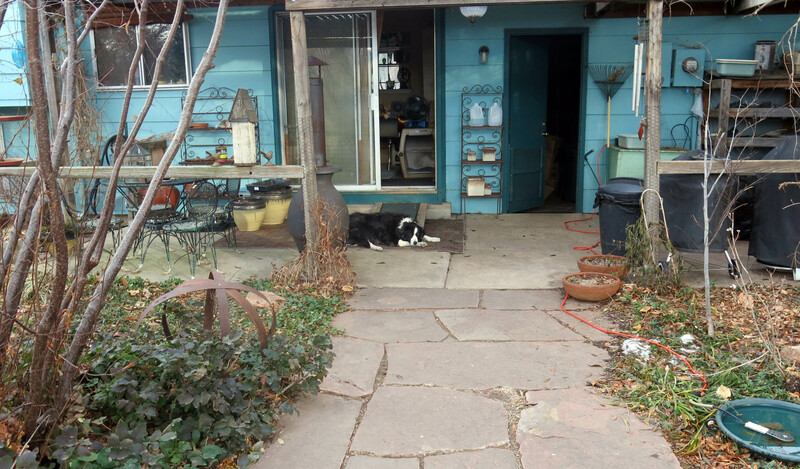 We purebred border collies really don’t like to be hot, and that goes for central heating too. Ideally, we would live in a castle, and the guy I live with could sit by the roaring fire in the library, and I could lie on the cool stone out in the hall. Good “after” pics. That iris is a doozie! Thanks. 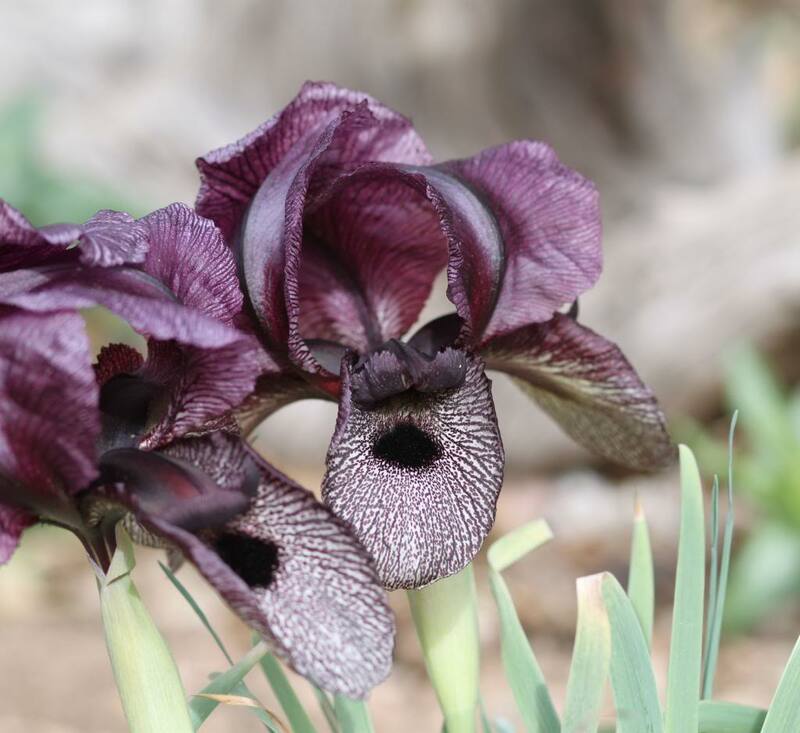 The iris comes from a sunny, windy, dry part of the world, very cold in the winter. That sounds familiar, huh. Sunny and windy today; the guy I live with was afraid I might fly off like a kite, what with the weight loss and all. But my feet stayed on the ground. Thank goodness for gravity, dear Chess. Yes, thank goodness. The wind has stopped. Warnings of winds up to 90 mph were issued, and we still are supposed to have wind tonight. It can be scary. Wow. We think 70 is pretty good around here. All the sand dwellers would be in a tizzy if 90 predicted. It comes from the highest part of the Continental Divide, just west of here, and swoops down, but 40 is more like it. The garden looks really clean now …..